A brick cross is inscribed into the second story brick of the building. 705 12th Avenue SE was constructed in 1926 as a convent to house the nuns of St. Lawrence Catholic Church. The residence of 705 12th Avenue is one of the oldest structures in the historic Marcy-Holmes neighborhood of the city of Minneapolis. 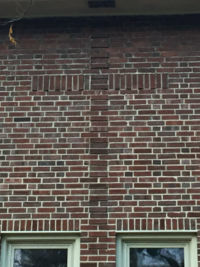 The home is clad entirely in brick, the original building material, and a remnant of its historic and spiritual heritage can be seen in the cross engraved in bricks that is built into its side. For this reason it stands distinct among the homes surrounding it, whose building components are limited to predominantly wood. In 1921, the congregation of St. Lawrence took out a building permit for an $82,000 brick and reinforced concrete structure. After the construction of St. Lawrence Catholic Church (now demolished) was completed by the firm O'Meara and Hills and dedicated on March 19, 1922, the leaders of the church turned towards the prospect of constructing a convent. Four years later, the convent was built across the street to house the Sisters of St. Joseph of Carondelet, who taught at St. Lawrence School. The order resided there for some forty years before it was relocated. Many stories and memories of the nuns, novitiates and patrons can be read here. By 1975, the building was sold to a private owner. It passed hands a couple times, eventually being bought by a man named Tom Wolne, who after residing in it then sold it to its present owners, Larry and Kathy Alberts in February of 2000. Larry's interactions with a group of young men shaped the home into the communal nature it carries today. In 2008, twelve men who sought spiritual mentorship encountered Larry, who is currently the lead pastor of Way of the Lord church in Blaine, Minnesota. They had lived for a year together previously, and sought from him spiritual guidance and wisdom concerning the value of brotherhood. Larry suggested that the men move into his old home as tenants, and they accepted. The spiritual legacy of the property combined with the "intentional brotherhood" of these men sparked a small movement in the Marcy-Holmes neighborhood. Inspired by the choices of these men and spurred on by the results of strong-bonded friendships, other likeminded young men and women followed the pattern of the "705 Men" and moved into intentional houses of their own. Today, there is a burgeoning community of "705ers", young men and women who have joined under the umbrella of similar cultures inspired by the brotherhood of the men of the house. Each Thursday evening, the home hosts 25-50 people, residents and non-residents of the community alike who gather to worship, hear a message, and share life together. It was constructed in Colonial Revivalist style in 1926, a common style of the early 20th-century. The home now has four renovated floors. Under the ownership of Tom Wolne, the basement, main floor and second floor were refurbished. The basement was renovated first, though some spaces and rooms have been left in more original condition than others. Most recently the attic has been fully renovated in contemporary style, including central heating and cooling, unique to only the attic. This was done under the current ownership of Larry and Kathy Alberts. The chapel on the main floor. The bedrooms on the main floor were converted into a sitting room and a library. A large unused room in the basement was converted into a bar room; the walls were painted with a room-long mural to reflect this. The mural has a painted bar, drinks, and even "doorways" to other rooms painted into the walls to represent an actual bar, an ironic departure from its original intent. A panoramic photo of the mural in the study. Today, the home is the residence of a Christian community of men who rent the home from the landowners. It also serves as gathering place for the goings-on of a small Christian community that the residing men are affiliated with. This community consists of brother and sister homes that were founded by like-minded youths who desire to come alongside the men of the “705 House.” The community found its roots in the spiritual heritage of the nun’s dormitory when in 2008 twelve men who sought spiritual mentorship encountered the landowners Larry Alberts and his wife. 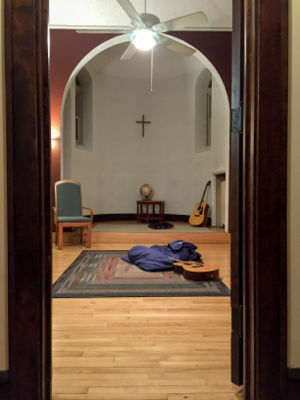 This passing from convent to personal residence to spiritual community living has in many ways brought the space use of the home full circle, back to its roots. 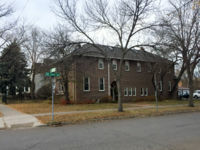 Though the Catholic church which once stood across the street has been since demolished, the home at 705 12th Avenue SE continues to house similar community to the one it originally contained. "About MHNA." Marcy Holmes Neighborhood Association. Creative Arc, Inc., 2012. Web. 20 Oct. 2014. "Historical Timeline." CSJ St. Paul Historical Timeline. Sisters of St. Joseph of Carondelet, 2014. Web. 21 Oct. 2014. Jameson, Nate. "705 Community." 705 Community. N.p., July 2012. Web. 21 Oct. 2014. "Marcy Holmes Home." 705 12th Ave SE, Minneapolis, MN 55414. Zillow, n.d. Web. 21 Oct. 2014. Petersen, Penny A. "Chapter Three. Churches: Providing Spiritual and Cultural Connections." Hiding in Plain Sight: Minneapolis' First Neighborhood. Minneapolis, MN: Marcy-Holmes Neighborhood Association/NRP, 1999. 39-40. Print. Rogers, James. "Interview with James Rogers." Personal interview. 18 Oct. 2014. Sr. Godley, Benignus. "1: Godley, S Benignus: Autobiographical 1886-1975." Interview by Ann Thomasine Sr. Sampson. Sisters of St. Joseph Archives. Sisters of St. Joseph, n.d. Web. 20 Oct. 2014. <http://news.arcasearch.com/usmnssjcd/>.